I would like to share this very interesting translation that Pacifist posted at http://dokdo-or-takeshima.blogspot.com/. It is related to the Dokdo/Takeshima debate. The period between between 1870 and 1880 was a decade of confusion for the new Meiji government in regard to Takeshima (Ulleungdo) and Matsushima (Liancourt Rocks). The reason for the confusion was partly that Japan had just recently emerged from almost two centuries of isolationism and was in the beginning stages of reassessing her territory, but the main reason for the confusion was a 1789 mapping error of Ulleungdo made by a British ship, which mapped the island much farther northeast than its actual position. The British called the island Argonaut. Previously, the French had also mapped Ulleungdo at its correct position and called it Dagelet. This resulted in Western maps showing two Ulleungdo’s, one real and the other non-existent, as can clearly be seen from the maps of that period. The new Meiji government referred to these inaccurate western maps when making their own maps and often mislabeled the non-existent island of Argonaut as “Takeshima,” and Ulleungdo as “Matsushima,” which was the name the Japanese had been using for Liancourt Rocks. In 1876, a Japanese businessman named Mutoh Heigaku (武藤平学) proposed to the Japanese Ministry of Foreign Affairs that the government allow him to develop “Matsushima,” which he knew to be Japanese territory; however, the island he assumed was Japan’s Matsushima was actually Ulleungdo, which the Tokugawa shogunate had previously given to Korea. Mutoh apparently believed that the non-existent island of Argonaut was Korea’s Ulleungdo and the real Ulleungdo was Japan’s Matsushima. Mutoh’s 1876 proposal to the Meiji government was entitled “Argument for the Development of Matsushima” (松島開拓之議). The document, which is translated below, started a Japanese government investigation to determine exactly where Mutoh’s Matsushima was. The investigation continued until 1880, when Japan finally sent a ship to survey the area. The Japanese ship finally determined that Mutoh’s Matsushima was actually Ulleungdo. Argument for the Development of MatsushimaI humbly say this. I am from the countryside and of humble birth. I am not talented, so I am not a man who considers national affairs or national policy, which makes me unsure of whether I should talk about something I do not know well. I have hesitated to write about this, but since it may help to strengthen our nation, I cannot refrain from talking about it. It involves an island called Matsushima, which is located northwest of our country. I have traveled to Vladivostok three or four times in the past three years, and I have seen the island from a distance whenever I go there. Although it looks to be just a small island, it could be profitable for the Japanese Empire since it is more significant than Ogasawara island in the south. Nevertheless, the island has no residents or arable land. Naturally, foreigners take profits from the island, but I cannot stand this. Foreigners are already freely cutting down trees, and I have heard that they sometimes carry the logs away by ship, so here I submit a petition with a summary. Matsushima, which is located north of Onshu (Oki island), is an isolated island about five or six ri (20 to 24 km) long from north to south and two to three ri (8 to 12 kilmeters) wide from east to west. [The map to the right shows Ulleungdo labeled as “Matsushima” and the non-existent island of Argonaut labeled as “Takeshima, 大日本四神全図 – 1870年、橋本玉蘭著] No houses can be seen from the sea. Matsushima and Takeshima exist between Japan and Joseon. Takeshima is closer to Joseon, while Matsushima is closer to Japan. On the northwest coast of Matsushima stands a wall of rock stands and there is a precipitous cliff several hundred jo (1 jo equals 3.03 meters) high. No one can get close except flying birds. On the southern coast, the mountains gradually decrease in height sea level. There is a cascade of flat land about 30 to 40 percent of the way down from the mountains, where it would be possible to cultivate fields. There are small inlets at various places along the shoreline, which should be convenient for mooring boats. The island is full of pine trees which make the island look dark green.People also say there could be a mine on the island. I have already heard from an American named Cobel, who is staying in Vladivostok. He said, “There is an island that belongs to Japan called Matsushima, which Japan has not started developing yet.” If Japan allows some other country to possess an island under the jurisdiction of Japan, it means Japan is giving away Japanese treasure to another country. The island has a mine, huge trees, and there should be large amounts of fish. If you could lend me the island, I would make a big profit from it each year. I think the fishing would be profitable, but there would be more profit than just from fishery. This man, Mr. Cobel, is living in a huge residence in Vladivostok. He is a famous merchant, and few of the merchants could surpass him, but he is not only engaged in trade; he also gives his undivided attention to mining. He operates a mine that uses many Manchurians. He asserts that there should be a metal mine on Matsushima. I have seen Matsushima three times or four while traveling back and forth by ship over the past two or three years. Although it is not apparent from the appearance, there could be a mine. The island is full of huge pine woods with some barren hills, which mining specialists say should hold a mine. However, since I haven’t heard of a judgment about a mine, I will not argue more about it. I would like to cut down large trees on the island for export to Vladivostok, where a new harbor has just been opened, or I could sell them in Shimonoseki for profit. If there is a mine, I would start a mining project while also developing fishery and agriculture, which will benefit our empire. Since Japan has already concluded a treaty with Joseon, we could trade with each other if a harbor is opened somewhere in Hamgyeong Province. Matsushima is an important island located in the main sea route. When our ships or their ships are in trouble in a storm or needed firewood or water, it would be convenient for them to anchor at the island. As the harbor at Vladivostok becomes prosperous, ships from other countries will travel to and from Vladivostok to trade. They will also have to take shelter at the port of this island if they met a storm or need firewood or water. Therefore, we have to open a harbor and build a lighthouse to show that the island is ours. The sailors of other nations would feel relieved and respect the thoughtful policy of our empire. This would be like killing two birds with one stone; that is, treating outsiders with humanity and making profit for ourselves. More show of love and humanity between Japan and Korea would not only benefit the two countries but will also firmly build the respect and friendship for our empire from the people of other countries. I hope you will open this island, bring in fishermen and farmers, and try to harvest its products. I have taken three or four voyages past the island over the past two or three years, and whenever I look at the island, I always think that a port of the island should be opened. Especially, when I visited Vladivostok in November 1875 (the 8th year of Meiji), we had a storm off the southern coast of the island. We feared we would run aground at Matsushima, and all the passengers on the ship had a hard time. At night, the storm changed to a snowstorm, and we could not see the island. All the passengers worried silently, so I would like to request that a lighthouse be built there as soon as possible. Some say that if Japan touches Matsushima, Joseon will claim it, but Matsushima is nearer to Japan, and it has belonged to Japan since ancient times. It has also been shown as Japanese territory on Japanese maps. It is Japan’s land. As for Takeshima, a dispute arose in the medieval period of Tokugawa, and it was given to Joseon, but there was no argument about Matsushima, so it clearly belongs to Japan. If Joseon tries to claim it, we should admonish them and use various evidence to prove that it is a Japanese island. It is not only in a critical location for traffic between Japan and Joseon, but it is also in a critical location for travel to countries to the north. Also, it is urgent that a lighthouse be built at good harbors in Japan and Joseon, which will benefit all countries. Interesting. So, in other words, both Korea and Japan neglected those islands in the Sea of Japan (yes, I use SoJ in English. East Sea is used only in Korean). Nice to know that Japan can’t argue that they were their original territory. Now, back to fighting over the 1800’s. I don’t know what you mean by “original territory. Whatever you mean, you need to note that Japan had effective control over Dokdo/takeshima during Edo period, It is just this period mentioned above that Japanese effective control was “relaxed” because there was fundamental regime changes. But Meiji government made it clear that she owned it and started again the effective control. So as a whole, Japan had effective control uninterrupted by foreign states. On the other hand Korean effective started after the war when Japanese administration was stopped by GHQ. It does not mean that Japan abandoned the territory. It seems clear which legally own the territory. I think you’re missing the point of this post. This is saying that Matsushima was “actually” Ulleungdo. In other words, it’s going against the thought that Ulleungdo was Korean. I take this as an example how both countries of the Sea of Japan neglected their territory, leading to the argument today. This article the similar to the article I have at my website. This article shows 2 things. First it shows a lack of territorial perceptions by some Japanese. Second it shows how they were aggressively trying to grab whatever land they could lay their hands on during their expansionist era. The maps provided are some of many showing Seibold’s positioning. It would be very presumptious to assume the author of this letter cited the maps provided. There are hundreds of Japanese maps showing Seibold’s incorrect Westerly locations of Takeshima and Matsushima. Only a few rare examples show three islands, thus it is highly unlikely the author of this text was citing these three island maps. Remember in 1877 the Japanese Home Ministry decided Ulluengdo and Dokdo were not Japanese territory. The 1877 document didn’t say Ulleungdo and “Dokdo” were not Japanese teritory, It only said that Ulleungdo and another island were not Japanese territory. I am reading now the Book of Official Documents (公文禄) of the Ministry of the Internal (内務省) compilated in 1877. The first part is the document you, toadface, know well as the “Dajoukan Document”. The first text was the origin of the “another island” because there are no other documents relating another island in the book. All other documents state only about Takeshima (Ulleungdo). But if you read the text above, you will notice that the “Matsushima” in the text meant Ulleungdo. Takeshima was of course Ulleungdo, but Shimane prefecture thought there are another island like Ulleungdo, but this was not Liancourt rocks. They took the same misunderstanding as Mutoh Heigaku did in his “Argument about Development of Matsushima”. I think the “Takeshima” in the text was Aronaut island while “Matsushima” was Dagelet island which was a real Ulleungdo. Then, the book included the document from the Edo period – document of the Shogunate, document from Korean official to an official of Tsushima feudal clan, document from the Tsushima official to Korean official etc continue. These documents only mention “Takeshima”, not “Matsushima” or another island. And at the end there is a document of summary made by the official of the Meiji government, Maejima Hisoka, which said that as to the inquiry from Shimane prefecture (they asked how would they do about the registry of land of “Takeshima”), Japan is not related. So toadface, you only read the very first part of teh documents and said that “the Japanese Home Ministry decided Ulleungdo and Dokdo were not Japanese territory” but it was not true. You have to read all of the documents, a picking up one portion of the huge documents is sometimes misleading. Please note that the summary in the end of the book didn’t say “Dokdo” or any other island but Takeshima. I am reading now the Book of Official Documents (公文禄) of the Ministry of the Internal (内務省) compiled in 1877. The first part is the document you, toadface, know well as the “Dajoukan Document”. Sorry, I posted almost identical postings. Nice to know that Japan can’t argue that they were their original territory. It is not correct. They didn’t mention Liancourt rocks at all here. They are arguing about Takeshima and Matsushima, but Matsushima is not the old Matsushima that was Liancourt rocks. It seems that when they talked about Takeshima and Matsushima, Takeshima was a phantom island, Argonaut island and Matsushima was Dagelet island, real Ullengdo. But when they talked only Takeshima or Matsushima separately, it means Ulleungdo each. Anyway, they didn’t pay attention to Liancourt rocks here, so you can’t say that “can’t argue that they were their original territory”. The important thing is that Matsushima in the document didn’t mean Liancourt rocks. And another island in the 1877 document didn’t mean the rocks. Pro-Korean people used to say that Japan admitted that Matsushima (=Dokdo) belonged to Korea, but it’s not true. After all, all the documents are saying only one thing that “Ulleungdo belongs to Korea”. I agree to some extent. But the point is Korea has been neglecting Takeshima/Dokdo until after WW2.Japan neglected this area only for this period. In 1877 the Ministry inquired where or not Ulleungdo and “another island” were part of Shimane Prefecture. The fact is no Japanese maps of Shimane Prefecture after the inquiry show Dokdo as part this prefecture even though minor islands like Minoshima are included. Play your silly island shell game all you want. So Pacifist and Ponta you should have included the enclosed map with the 1877 Inquiry because it shows the Japanese were not confused about extra islands at all. You can see all maps after prior to the 1905 military annexation of Dokdo fail to show Liancourt as part of Japan. Pacifist, the 1877 document had an enclosed map showing the shape and locations of the islands included. Again, you say it without reading all the books I mentioned. An article in the book referred to the map. It says: 「今大谷氏伝フ所享保年間ノ製図ヲ縮写シ是ヲ附ス」 which means “We will attach a reduced copy of the map which Oyas had handed down from the Kyoho years (1716-1735)”. So it was not related to the reports in the book of documents. And the name of island is Isotakeshima, not Takeshima. It was not true. The Ministry asked about only Takeshima. But the text from the Shimane prefecture included “another island” (new Matsushima, or Dagelet) which the Ministry didn’t ask. So the title of the first document included Another island. Pacifist, stop rambling, you are boring me. Shimane Prefecture never included any other minor islands outside of Oki Island and Minoshima prior to the annexation. The text does not at all read he reached Matushima Pacifist. When you translate a document you should include. a)An original copy of the document b)When possible give a digital text version of the text. c)an English translation of the text. You embellished your translation on your link to say. He reached Matsushima which is not the case. It says he reached “this place”. Pacifist it is clear your translations cannot be trusted because you are filling in the blanks without telling your readers. Here is the translation you are forcefully misleading your readers on. You see Pacifist nowhere does it say he drifted to Matushima it says “he drifted to this place” The place he drifted to we all know was Ulleungdo, (Takeshima) and not Matsushima (Dokdo) Moreover, the physical description of Matsushima given does not at all match Ulleungdo Island. It says Matsushima is only 30 Jung, and trees and bamboo are rare. Thus, your translation is misleading. The Map given by the Dajokan (the highest authority in Japan) can be seen as an accurate territorial perception by those in power in Japan at this time. They were not as confused as those on this forum are trying to mislead us to believe. Though the distances are questionable we can see the maps of the Japanese leaders only show two islands. It also clearly showed Matsushima as Dokdo, the form is quite clear. Pacifist, you are hanging on details that are moot. No maps of Shimane show Dokdo as part of Japan prior to the 1905 annexation. If you have any maps showing Dokdo as part of Shimane Prefecture I’d love to see them. Here are the maps again. Then, Shimane prefecture wrote the letter of inquiry asking how would they do about the registry of land of Takeshima. The document mentions that there were officials from the geographical department of the Ministry who were making their rounds to Shimane prefecture and that they asked the prefecture about Takeshima in the Sea of Japan before the first letter above. These facts were all written in the book of official documents. toadface, please don’t say a word without reading the original documents. You pro-Korean people insist so without any evidences but your thoery is groundless. They were calling Liancourt rocks as “Oki no Matsushima” (Matsushima of Oki) in the 18th century. It was included in the Oki county. In those days, to go to Ulleungdo (Takeshima) was strictly forbiden but to go Matsushima (Liancourt rocks) because it was Japan’s territory. was strictly forbidden but to go to Matsushima (Liancourt rocks) was not because it was Japan’s territory. Again, you didn’t read the original text yourself. You can magnify it if you click it. The first line (the far right) mentioning about “Matsushima”. Look at the 3rd line; the upper half is saying “…produces fish and animal” and without a space it related “In the Eiroku years….”. You are misleading, not me. I will humbly give this honor back to you sir. Pacifist, the description of Matsushima distance,(80ri) size (30 jung), vegetation (sparce) location etc is unmistakable. Please don’t embarrass yourself further by playing silly “grammar” games. I starting to feel sorry for you. This oddball document by th Oya’s mean little if anything. There are scores of Japanese maps prior to and after this document showing whatever relationship they had with the island it was neither continuous or representative of Japan’s territorial perceptions of the Dokdo. There is a guy my hometown that says he owns the Brooklyn Bridge Pacifist. Do you understand what I’m talking about? 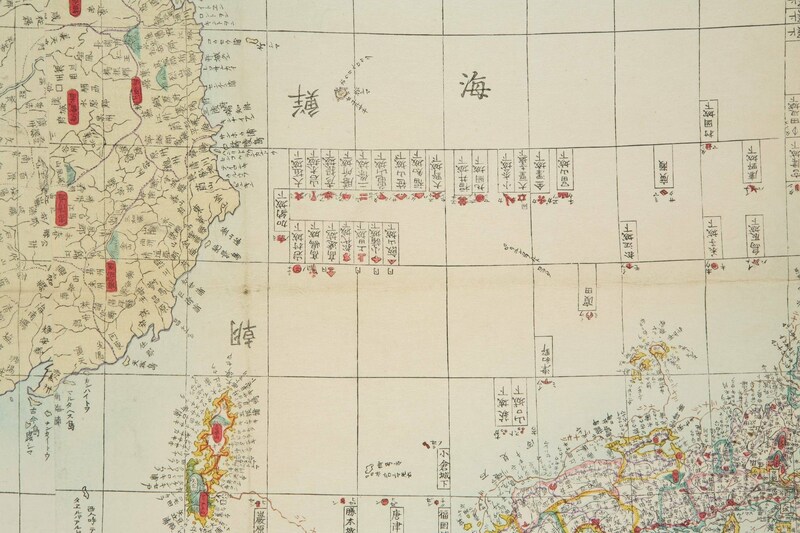 Maps of Oki Prefecture of the 17th Century show no Dokdo Pacifist. Hanmaumy has tons of maps of Shimane with no Dokdo Pacifist. There are tons of national maps of Japan showing no Dokdo or Ulleungdo. Pacifist try to be logical and approach things in an academic manner instead of looking for typos and ambiguity in ancient Kanji documents that are often neither plural nor specific. When we see over a hundred national maps of Japan that fail to show Ulleungdo or Dokdo as Japanese land we can only conclude it was not thought of as part of Japan. As I’ve told you many times, hundreds of maps without the island won’t prove anything. It is strange for you to say so because Korea has no maps of Liancourt rocks at all until the 20th century, while Japan has minute maps of Liancourt rocks since the Edo period. Did you notice that you are saying unlogical things which no one won’t understand? You should admit that you were wrong. The things you wrote above were not true and you can’t refute. You must admit it, toadface. Shimane Prefecture never included any other minor islands outside of Oki Island and Minoshima prior to the annexation. You embellished your translation on your link to say. He reached Matsushima which is not the case. It says he reached “this place”. These are examples what you said without evidences but these were proved to be false, toadface. Why can’t you reflect on what you’ve said? You are always running away when your theory became disadvantageous, but all the readers of this site look at you, toadface.